Get free admission into the farm on July 7th, to watch the arrival of the Ships coming up through the Miramichi Bay. There will be a BBQ with hot dogs, haggis sausages, pop, water and Mr. Freezes. MOVIE: Pirates of The Caribbean ‘Curse of The Black Pearl’ at The Vogue Theatre, on Cunard St., Chatham. Donation at the door for up-coming renovations. Free small popcorn with a Pirate Costume. Waterford Green (Chatham waterfront). Free Admission. Sponsored by EastSide Church. A 26 ft. Voyageur Canoe will embark & convey passengers along the banks of the river & allow travellers to see the Tall Ships close-up from the water. Join a re-creation of one of the famous picnics by PETER MITCHELL, Father of Confederation, shipbuilder, and Island owner, and also meet Chatham Father of Confederation, JOHN M. JOHNSTON. A COSTUME PHOTO BOOTH will provide an opportunity to don 19th Century costumes & have a memorable photo taken. Local Celtic Dancing group in Chatham (Government Wharf). Free. Meet the Captains of The Tall Ships & hear their stories of life on the high seas. Newcastle at the Miramichi Port Facility. Free. Visit the historic resting place of many of Miramichi’s earliest English settlers including William Davidson, and hear stories of the past, of the bizarre, and of the supernatural. Face Painting and family activities at both locations all day long! Miramichi historians will speak on the region’s connection to the shipbuilding industry, whisking their audiences into the Age of Wood, Wind & Sail. Take a step back in time to an age of wooden ships and iron men. Visit with Scottish pioneer William Davidson, fishery & ship mast businessman; James Fraser, entrepreneur; Joseph Russell who built five large ships at once; and hear the story of John Harley & George Burchill, who gave the Island its last golden age. 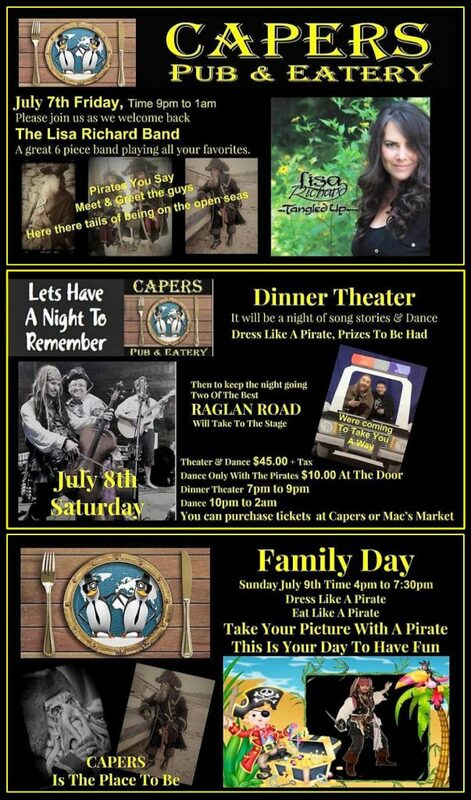 Watch for five real life Pirates roaming the wharves and see what shenanigans they are up to. 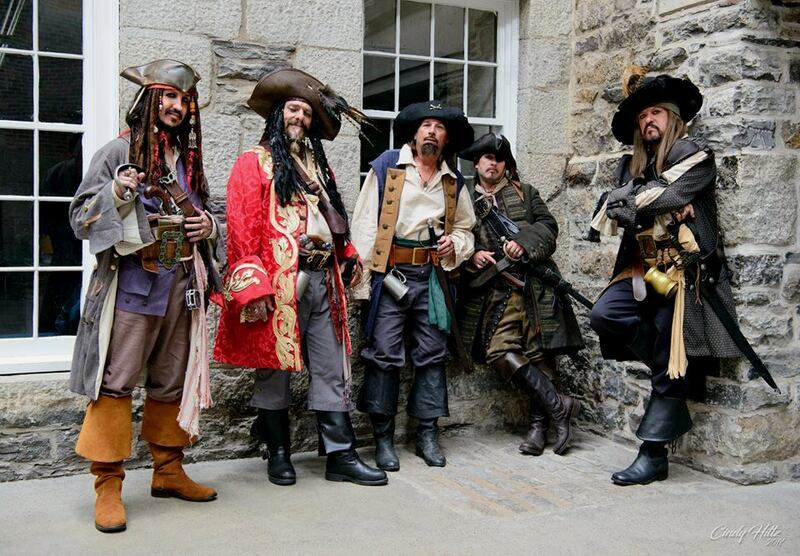 FREE PHOTO opportunity for the whole family with these bandits of the high seas. HELICOPTER RIDES by ADVANCED HELI-FLIGHT LTD.
See the Tall Ships from the air. $60 per person for 6 minute tour. Weather permitting. Register at The Visitor Information Centre, 21 Cove Rd (French Fort Cove) off King George Hwy. Fri. July 7th afternoon; Sat. July 8th & Sun. July 9th all day. Ahoy Matey! Come try to escape with friends from our newest room Pirate’s Treasure. $20.00 per person. Thurs. July 6th thru Sun. July 9th. By Appointment (506-626-0700). Groups of 2 – 8 people. Ages 14 plus. Located at 158 Wellington St. (Chatham). Other rooms also available: Down The Rabbit Hole. Virus. Cabin Fever. Visit their Facebook page for more details.